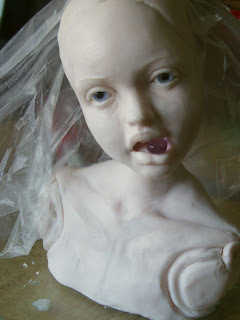 Is the title of my new sculpture.She is taking longer than I thought. She has no hair or soft elements. I even sculpted her eyelashes and a small braid in back. She wears a full black clay suit with gothic incised patterns, embedded vintage ink stained rhinestones and an aged ivory Lorraine cross emblem in front. I really love her expression and this style. The framing effect of the costume clay versus the painted skin colored clay. Id really like a buffed gloss finish to the black and then with some corrosion and aging effects on the surface. I think she still needs gloss on lips and around eyes. I dont know if I should paint her eyebrows black. Maybe soft brows make her eyes pop...What do you think? :) I feel really good about my work this year. Really stoked about some really special ideas I have. 1st day of my bust. no inkling whats coming except that I wanted a lollipop in her mouth. 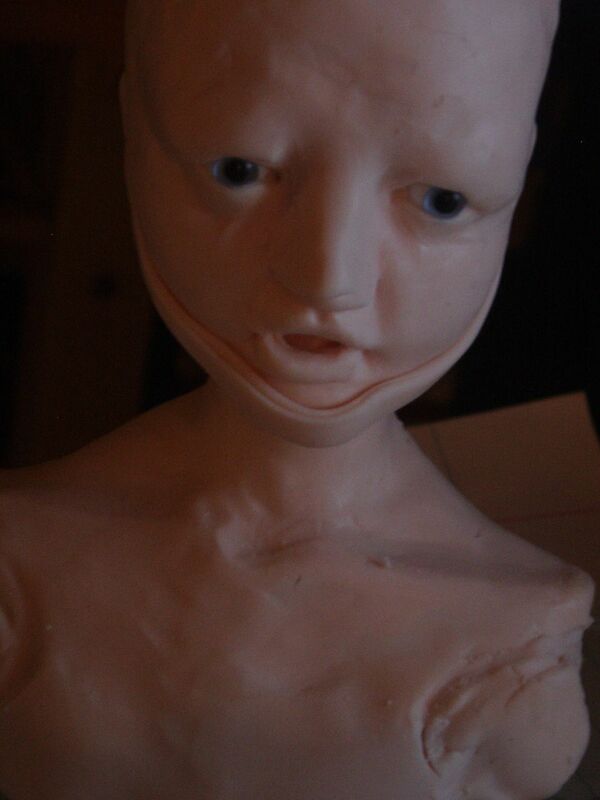 2nd day of working on my bust. Shes really turning out to be a cutie! Today it popped into my mind to make her theme "artifical sweetner" After hearing the No Doubt song of the same title. This is because I feel split in two. I often have to sweeten my works to make it saleable. 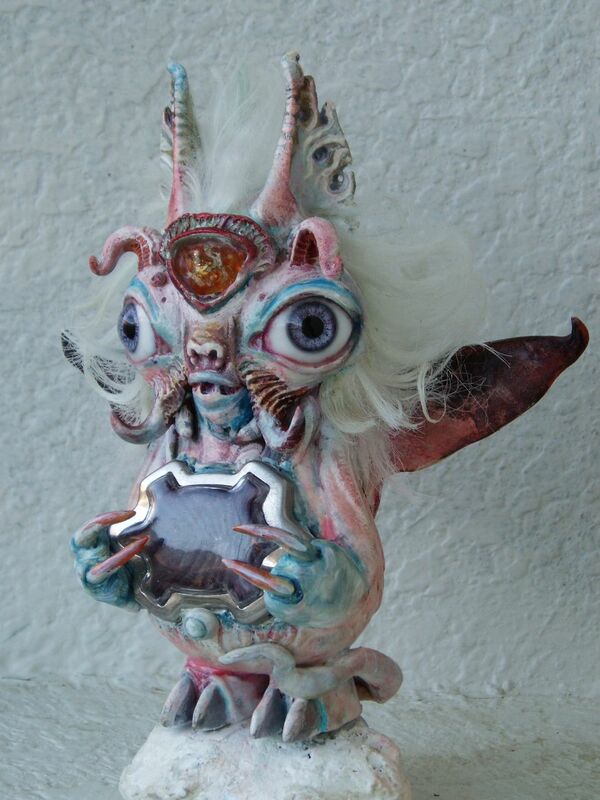 Much more with my fairy work than now but, being a doll artist part of it is making something appealing, pretty and sweet for others,but I also have a very dark surreal side.Thats not always easy to stick with and feel loved doing. its more like sticking your neck out! I take a lot of joy in my dark surrealistic play but, its tempered a sort of balance I suppose of beauty and danger. 3rd day: I worked on making her appear a touch older. More like a preteen. I juggled a few sweetner related names in my mind. Stevia, Saccharine,Faux Sugar, Splenda. Finally I decided "Hard Candy" was a nice compromise. It goes with her biting the jolly rancher so to speak..,but also the metaphor nuances Im fussy about. Today was hoping to have her in that oven and painted ,but I spent most of the day smoothing and pecking around the eyes to get just the right amount of expression. Added ears and more work to her shoulders and back. A bit of pastel on her lips and cheek livens her up. Sticky wickets children! Another rant for the new year! Im posting to warn BJD artists and doll collectors to avoid Catrina Sanders and her company like plague. Dont buy Briar from her as I will not see any of the money.And you will be gambling on to getting your doll. I have a new caster and we are discussing casting elf ear Neo Briar. Hopefully I can offer that to you later this year. 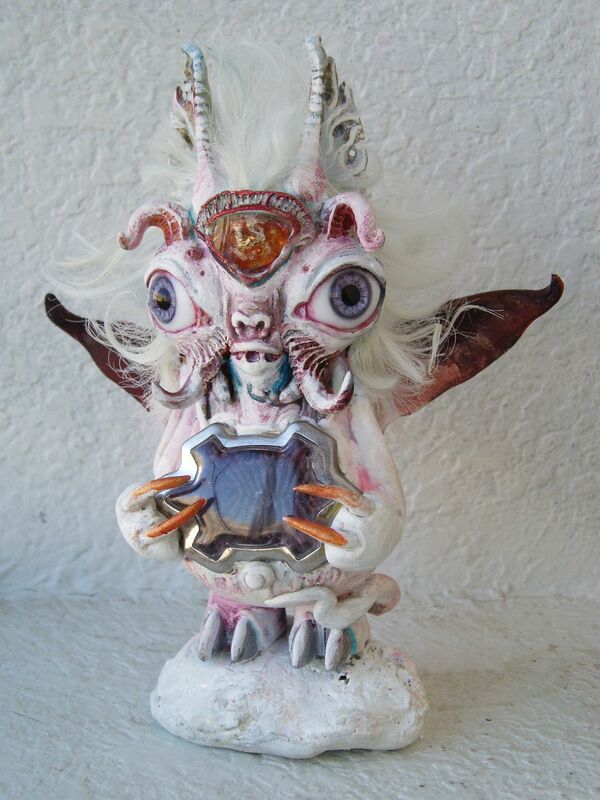 In Aug 2009 I sent a master Briar (elf ear version) to Catrina Sanders. It was never molded nor was it returned to me. I was told that the company was relocating , then that there was difficultly matching new resin. Things never went great with the company. Every couple of months Id write did anything sell? Oh yes some things sold... I was never notified for some reason when anything sold. Sometimes Id ask for a check to be cut and more weeks would go by before Id query again and would get some excuse or lameass remark like .. you wanted it now? UUUhhhh YES! Along with excuses like I broke my wrist, secretary is out sick or Ill cut a check after the dolls come back from the face up artist. You might remember my other post about Briar at IDEX and how I had lined up talented and well known BJD costumer Vallerie Zeitler to dress Briar but, I was cut out of the loop and she was instead dressed in hideous last minute make do gunny sack looking things. I was never sent a doll to check before final casting. I sent Briar unfinished I had become sick while making her and was told to just send her as is. Later I saw that the hands and headcap were left terrible and it was never addressed by Catrina. 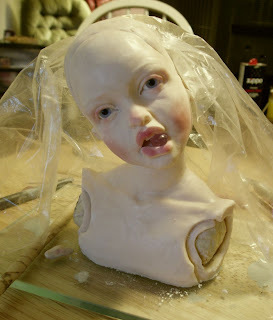 It was carried by me that my doll was imperfect. You can read online the trouble Bimong and Rachelle known as Lilycat had with her. from what I hear Batchix has also had difficulties. If you also had some problems feel free to post here your links and information. Ive been busy with secret projects and sooo you might have noticed few blog postings lately. I am having a BJD cast that hasnt been seen yet.. be patient yall! I hope to have limited edition busts available soon in a 250-300 price range. The sculpt Kush: Gold ,Iron and blood featured in the show Nightmare before Christmas"
Im so honored that she is also owned by photographer and art film maker John Santerineross. I hope to do some collaboration with John. Perhaps a doll he uses in one his shoots. 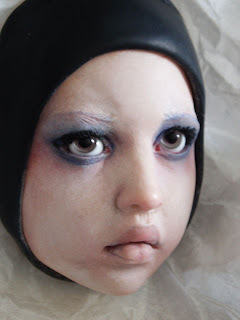 its a grittier venue for me but, I am interested in photos of figures and dolls as an art form unto itself. I also got a small photo published in the Christmas issue of "dolls" magazine within an article about Kat Soto and her fabulous work. Cant seem to find a thumbnail of the cover. let me know if you see a jpg! 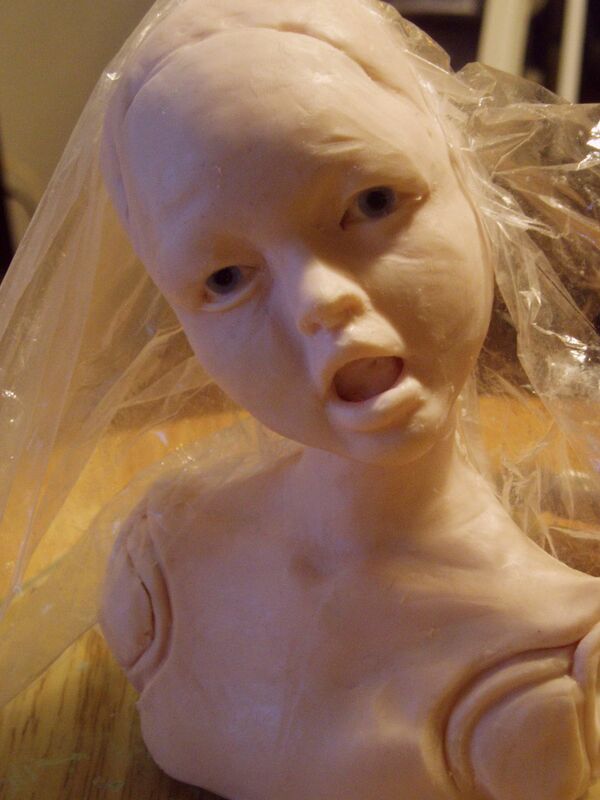 My bust Leacothea got in and its the first time for my OOAK sculpture in a magazine. 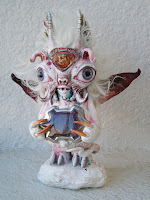 My customized Gordo "Flying Yeti" of the Flying Yeti Brigade showed at The "my plastic heart" booth at comic con and sold right away!! I was a bit worried this was my first time tricking out a designer toy,but it was so fun and different than what Im used to. Lots of Dremel work, and some fitting of parts, big glass eyes, some epoxy clay sculpting of claws and twisty horns and wings. 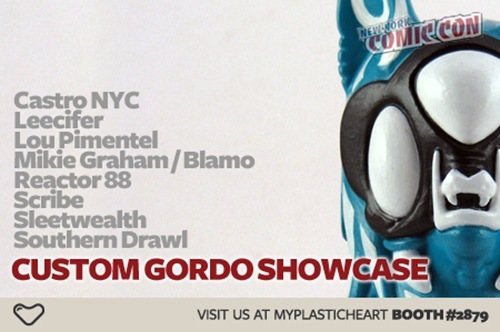 This blank Gordo came to me care of Brent Nolasco Very talented customizer whos makes his own toys too. Anyway I have some more wacky toys to play with so, well see what develops. Surreal painter/sculptor inspired by old master methods,deep significance with nature,natural media and ear tuned for spirit. This is sumptuously,gorgeous and compelling. But the entire work,like ALL of your sculpted structures,has such moody sophistication,unnerving beauty and so serene,like whatever turmoil might exist around them,they have found that inner peace. They have an ageless quality and are strong and yet their beauty seems fragile,almost fleeting, like the wind blowing through their hair. I don't know can you tell I love your art? Trust Pigss Top 13 Best Japanese Vinyl of 2013 Blood Thirst made the list! Where you can found the fly fishing equipment completely? For those whos moma's never taught em not to just take other peoples stuff. Copyright 2008-2012. All photos, text and artwork on this blog are the intelectual property of Anita Collins aka Sleetwealth TM. Do not copy , reproduce or use in any way without my permission.